I finally got my new carders from ebay, and have been experimenting with them to blend colours together, and to mix some of the lovely icelandic wool in with other wool too. I have some pictures of my current work in progress and will post some more soon when I am happy with it and get round to felting it. Need to get on with some more tea cosy making, I have several family members wanting one now! Autumnal colours for Mum & Dad and something exciting for an Aunt. Thinking about experimenting with adding paper in the felt, anyone had any success with this? 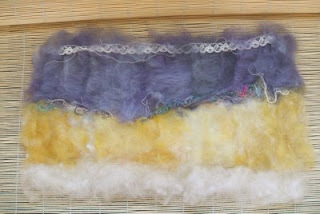 I've used silk paper in the top layer which works well and has a nice texture and you can also use layers of silk carrier rod which has a papery texture.